Lists. We use them all the time. Every time I go to Costco I have a hand-scribed list from Marni. I see others just like me in the grocery store… lists on paper, lists on phones, and calling in for a verbal list. Everyone in the famous movie that was on Schindler’s “list” actually lived. It was a powerful list. More than fifteen years ago, I challenged a campaigner group to pray for ten of their unsaved friends. A mom called me and asked if I could come by while her son was in school. I came by and she marched me into her son’s bathroom and there on the mirror was a scrappy piece of paper list of ten kids names. “What is this?” I told her that these were the kids her son was praying for… all were in 9th grade. Today, everyone on that list knows Jesus and 4 of them are on Young Life staff. The Discipleship List was an assignment that really stuck with me when I went through the official “Young Life Practicum I and II” sometime in the late 80’s. This list has two parts. First, who are the kids that you are discipling? Second, what are you wanting them to learn, experience, and do while they are under your tutelage? It starts with YOU knowing the kids that you are discipling. (Discipling means teaching them to follow Jesus with their life, to love the word, prayer, to have fellowship, to be obedient, and to strive to follow the great commission.) The famous quote, “If you fail to plan, you plan to fail.” You want to have a plan for who you are discipling. Again, it starts with a list. Who has the Lord laid on your heart to “pour into.” We call it so many things in Young Life. There are phrases you might use that I don’t: my campaigners, small group, discipleship group, student leadership team, green beret campaigners, student leaders, etc. I would say it is as simple as a list. Who are the kids that you are going to give it all to? You are pouring your life into them – you are available to them always, and your life is an open book. They know they are on your list, and you know they are on the list. I remember going to a restaurant that was owned by long-time Young Life supporter Bob Farrell. Sometimes when you went to his Stanford’s restaurant you would see a person following the waiter or waitress around the restaurant. They literally just followed. At times, it even felt a little awkward. Well, it was actually a beautiful thing. They were “in training.” Bob wanted them to see it all, the full scope of what it meant to take care of multiple tables, crunch time, mistake orders, etc. Who is following you around? What are you wanting to make sure they see? In Young Life, at least in this 5 for Friday, I would hope people would make a “list.” Who is in your life? What list do you want to make sure they end up learning, experiencing, and doing? Have a quiet time for 30 straight days. Global Training - What YL Can Do For You! Have you ever wondered how your favorite YL Administrator seems to know all of the different resources available in Young Life that you haven’t heard about? We are pulling back the curtain to share some of our favorite game changers with you. Below are 5 things that Young Life can do for you that could help Field staff do their job more effectively and efficiently. 1. STAFF RESOURCES: Yes. www.staff.younglife.org The website that we all visit every single day. Did you know there are great resources on the staff website? A few of our favorites. Rental Car Discount Codes: YoungLife has negotiated discounts with six national rental car companies! The next time you’re traveling for business and have to rent a car these codes will save you money! Publisher Discounts: Looking for great donor or leader gifts? Check out our negotiated rates with 13 publishers before you buy books! Computer, Printer and Phone Discounts: Need a new laptop or printer for your YL office? Make sure you contact the Help Desk for information on how to save BIG with Apple, Dell, AT&T and Verizon. 2. THE YOUNG LIFE PODCAST: Any time Young Life people gather, ideas start to flow. The Young Life Podcast gives the Young Life family a platform to hear and learn from a diverse group of pioneering fellow staff with a variety of cultural and leadership perspectives. This is ‘cabin time for your commute.’ Like a cabin time, there will be a wide range of content, conversations between leaders of all types, an equal playing field, laughter, prayer and encouragement to continue the conversation. You can follow them (@younglifepod) on Twitter and Instagram. Incredible guests, including Donna Hatasaki, Veronica Tutaj, Kristy Fox, Millie Carter and Newt Crenshaw, among others. Don’t want to listen online? Visit them HERE. 4. STAFF DEVELOPMENT, MANAGEMENT AND EVALUATION TOOLS: As we enter ‘evaluation season’ YoungLife has some wonderful resources for all types of staff evaluations. Everything from ‘annual reviews’ to ‘360 Evaluations.’ Simply type ‘HR Toolbox’ in the search feature on the staff resources page. Additionally, staff management resources are available to help you navigate the management process and support you in making good personnel decisions in your local area, Region or Division. 5. GRANTS & FOUNDATIONS: Young Life’s Grants and Foundations office exists to tell Young Life's story with excellence to help you connect with foundations for further funding sources. To get started fill out the Foundation Research Request Form so our research assistant can begin to find foundations in your area which are seeking to support missions like yours. Have questions? Call the Grants & Foundations office at the Service Center. Have questions about more helpful Young Life resources? Call Mission Assistance at the Young Life Service Center and they will help answer your questions. Administrators!! Want to help communicate more of this helpful information to your staff? Contact Kimberly Silvernale or Jen Reynolds for best practices! *For assistance regarding how to access the links above, please contact the Global Innovation & Training office HERE. We all have pictures in our mind of what Young Life camp looks like, right? However, there are a few camps happening this summer that look a little different from what we typically picture in our minds. Let’s take a look at two camps to see what I mean: one you know and one you don’t know. Let’s start with the one camp you probably don’t know: Nyarugusu. You don’t know it because it’s not a Young Life camp; it’s a refugee camp. Located in western Tanzania, between 139,000 and 400,000 refugees from DR Congo and Burundi live here in tents. Some have been here for over 20 years and some have just arrived. Over half of these residents are under 18 years old. They have fled warlords, rebel groups, tribal wars, genocides and food shortages. One of these residents is a Young Life leader Pascal (name changed). He decided to follow Jesus at a Young Life camp in Congo and became a Young Life leader before he and his family were forced to flee insecurity caused by rebel groups. Pascal is recruiting leaders and working with our team in Tanzania to begin Young Life in Nyarugusu. We hope to bring kids from this camp to a very different kind of camp soon. Now let's look at the camp you know: Timber Wolf Lake. Fast forward to July 3rd of this year. Picture 46 kids rolling off a bus at the welcome. Some are in headscarves, most laughing and speaking to each other in Arabic, a Burmese dialect or in Kiswahili. They are from Syria, Myanmar, Congo and half a dozen other places. All of them are from Southport High School in Indianapolis. Their leaders, Joe and Rachel Snyder, direct the area on the south side of Indianapolis where tens of thousands of these refugees have been placed. Many of them are part of the club at Southport High School. On July 3, 2018, they will experience a new type of camp...and Jesus' love for them. Across the world there are currently 22.5 million refugees and over 65 million people displaced internally in their own countries. More than half of these people are kids. Over 56% refugees live in sprawling tent camps in Africa and the Middle East. Over 3 million refugees live in the US. There are hundreds of thousands of kids, most of whom have experienced trauma people in Western Europe or the US cannot imagine. Most of these kids do not know, or may not have even heard of Jesus, and are being gathered in unprecedented numbers into our countries and neighborhoods. What an opportunity we have as a mission that cares for kids who are lost and looking for a place to belong! In YL Africa/ME we are committed to figuring out how to reach these kids. And people like Joe and Rachel are showing us all how to do it in our own cities. Ministry to widows, orphans, strangers and captives—this is real gospel ministry. God has positioned Young Life perfectly to be His hand in the lives of these kids and God is literally dropping these kids from the worst and hardest places on the planet into our backyards. Wow! Join the leaders in Africa, the Middle East, the Snyders and others as we figure out how to love and reach these kids and their families. **If you, or someone you know, is working with refugees in a YL context please email (kimberlygraceyl@gmail.com ) The YL Global Innovation and Training office so we can help them connect to others who are reaching these students in these unlikely places. We do love our TLA's in YL. I’m sure you can think of a few right now. Today, we want to focus on one really important TLA: IDP. This amazing tool (which comes in many shapes and forms, ours is at the link at the end of this article) is for you, me, and every person that works for YL. It’s a simple, structured way to think about your development as a person and an employee of YL. It will make all of us better servants of the Kingdom. The IDP is not your set of goals for the year. It is focused on your personal and professional development. You are responsible for developing your IDP. Hopefully you will discuss this on a regular basis (3 or 4 times a year) with your supervisor, but it really grows out of your particular desires for growth as a staff person. It is a tool that will help you get clearer about what your gifts are and what you are really passionate about. It is to be used regularly! It is simple, one page, and made for efficiency. You can add as much to it as you want but it is great ast is: 4 simple (and rich) questions. Look at the IDP, find some time to fill it out, and then schedule a time to go over it with your supervisor. This conversation could help decide your next YL training, camp assignment, or even ministry assignment. You can also get input from a mentor, your committee chair, or anyone who knows and cares about you. Now put “review IDP” in your schedule every four months. You’re on your way. You’ll never regret it! This is one of the best investments you can make, in yourself, in Young Life, and the Kingdom. During my first week on YL staff, I got a call from my Regional Director. He had sent out a letter and survey to our area committee about the new season of YL in our area. At the end of the letter he asked them about their ongoing involvement on the local committee. He was calling to tell me that all of them had chosen to step off the committee at this time....ALL of them. Because I didn’t really know what a YL committee did, I wasn’t overly concerned by the news. It was two years later, after operating without a committee, after knowing that anything that needed to be done in the area would have to be done by me, after feeling more and more alone in my life and ministry...that I begged a couple I had just met to help me build a committee. I’m still not sure why they said “yes,” but they did and I soon learned what a gift it is to have a group of adults who shared God’s call to reach kids in our local area. From that first committee couple (still some of my closest friends) to our Board of Trustees, I am amazed at the caliber, character, and commitment of those God leads to serve on a YL committee or board. Almost 40 years later, I am even more convinced that we cannot and will not reach all the kids God has called us to reach without them. Consistent communication between AD and CC (44% of AD’s meet with their CC’s 2x/month or more) is key! Attention to the definition of Committee roles and purpose is vital. The use and involvement of set subcommittees to work alongside the committee at large is on the rise and is healthy for growth. There is a desire for more training for CC’s from Region/Division/Mission levels. More contextual work needs to be done in how committee looks like in different types of settings. There is a desire for collaboration and shared best practices among CC’s. Stop and thank God for the men and women in your ministry! Pick up the phone and verbally express gratitude to them. Focus on the connection between CC and Area Director on a more regular and deeper level. Review the survey results with your entire Committee, perhaps even do your own Committee survey for more conversations. Click this link for Committee Resources and look for more to come from Global Innovation and Training to help staff and committees grow together in our call to reach and teach kids. Followers of Jesus embrace and enter their own life of discipleship in a myriad of ways – devotional, contemplative, communal, sacramental, missional, practical, theological, and more. Followers of Jesus embrace and enter the process of discipling others in a myriad of contexts – relational, conversational, missional, instructional, collaborative, and more. Those a lot of different words, so let’s take a look at how we practically do that. I like to think in terms of Discipleship Anatomy to help us identify and lean into these different contexts. Meeting with a small group of people to talk about life and faith. May include friendly chit-chat, discussion, prayer, Bible study, creative activities, etc. Meeting one-on-one to encourage and guide someone towards personal development and spiritual growth. May include everything in Face-to-Face, plus deeper levels of guidance, challenge, exhortation, encouragement, etc. Specific eye-to-eye times of deep challenge, guidance, correction, affirmation, counsel, and heart-to-heart difficult conversations. May include prayer, Bible study, deep conversation, pastoral listening, etc. Activity-driven context for those who may not yet be ready or comfortable with solely face-to-face connection, who are still learning how to converse comfortably, or who need to move in order to focus. May include play, action, competition, interspersed with questions, conversation, listening, etc. Working together in service or mission. Part of every discipleship/discipling context – the joining of two or more followers of Jesus in prayer, partnership, solidarity, and unity. The mysterious beauty of all these contexts is this: not only do leaders disciple their students and help them become more like Jesus, but students also disciple their leaders. As leaders listen, converse, respond, guide, encourage, and simply be with students, leaders themselves will become more like Jesus. In other words, the act of discipling others will circle back on itself so that spiritual growth flows both ways, and the hearts of everyone are changed. This is the most powerful and sacred discipling context of all. Let’s pursue it with a passion. I’ll never forget that trip, as it changed everything for me. It wasn’t just the fact that a big offensive lineman named “Mackie” would sing Neil Diamond songs at the top of his lungs from the middle seat. It was the fact that I got to experience a year of contact work in one week. If all of those things happened in a year, it would have been an outstanding year. But in 7 days? It was the best week of our lives. And it changed the way I did Young Life. I finally got it. It was so MUCH more than my guitar skills, song leading, and skits. Contact work clicked. Life from then on would be lived with kids and just two years later I found myself on staff. What will you do with your “year of contact work in one week” this summer? Don’t let it be the end of your ministry year! Let it be the start of living life with your kids. You’ve got relational capital. Cash it in! There will never be any easier contact work then the first few days of camp. Be rested and ready before you go so you don’t miss out on reaping the dividends of a week well spent. Let your leaders know that camp is actually three weeks. One week is out of town, and the other two are back home. During those two weeks, it’s time to run hard! Kids want to be together. Take advantage of that fact and build a foundation of contact work that will carry you through the year. After those two weeks, start summer campaigners up and own a night of the week. Cabin time does not have to end. Lastly, speak vision into your kids over the summer and prepare impact they will have over the coming school year through their Young Life club. For summer contact work and resources, click HERE. Ever wonder how you pack for a Young Life camp in Uzbekistan? A YL Staff leader’s packing list can include anything from t-shirts to shaving cream to candy and costumes. We asked Gary Parsons to give us a little insight into what goes into packing and preparing for camp over in ___________. The commitment is the same in neighborhoods all over America as it is across the world. Loving kids unconditionally wherever they are and whatever circumstance we find them in, doing everything we can to create an opportunity for them to hear the gospel and to know the love of the Father. In Matthew 4:19-20 Jesus calls us to be fishers of people, “‘Come, follow me,’ Jesus said, 'and I will send you out to fish for people.' At once they left their nets and followed him.” Dale Bruner said it best when talking about this portion from Matthew, “Come be my students and I will turn you into fishers of people. Jesus furnishes his invitation with an exciting promise. It is the promise of catching persons and of being effective with people.” As leaders go off to camp this summer across the globe we must hold on to this central truth, that every day we must follow Jesus with all that we have and trust his life living in and through us to bring the gospel alive in the lives of kids we serve. The calling is the same across the world whether it be in Uzbekistan, Nicaragua or Texas. What we pack in our bags physically may look very different, but what we pack spiritually is filled with the same life of the Holy Spirit and the same calling to be fishers of people. In John’s gospel chapter 15:16, Jesus says, “you did not choose me but I chose you and appointed you to go and bear fruit - fruit that will last and the Father will give you whatever you ask in my name.” This summer all of God’s resources, wherever you serve in the world are available to you through this truth. Ask God and he will supply all your needs. Camping Internationally may require some creativity in what we pack but no matter where you are we BRING the same thing- a heart devoted to Christ and passionate toward adolescents. If you want a checklist of what to pack for camp this Summer- double click HERE! Two years ago, myself and 30 other Young Life staff received an invitation to a new training course called the Legacy Leader Project that was researched and designed by staff as an “advanced leadership” training course. I didn’t know what to expect, but when I got off the plane to the first training I was struck by the diversity of other YL staff who would be joining in with me in this group. Our first meeting brought me literally to tears. Senior Mission leaders welcomed us, and each proceeded to offer a heartfelt apology. The apology consisted in their realization that to be a staff person of multicultural ethnicity or a woman on Young Life staff has often been a lonely, sometimes wounding experience in our mission. They shared their frustration, wanting to change the face of leadership in the mission, and yet year after year, it continued to look the same. The Legacy Leader Project was their attempt to provide training and preparation to be able to launch us to advance. For me, the honesty of this conversation was worth the price of admission. To me it signaled a new day had dawned for us in the mission of Young Life. We started with a two- day training on the spirituality of the Enneagram Personality Test. It has been one of the most significant tools for self-awareness and growth in my whole faith life. Rather than a static assessment tool, within the Enneagram there is both movement for health or disintegration and I can finally understand others who are wired differently. It has been huge not only for self-understanding, but as a way to understand others. The Legacy Leader training team alone was stellar. We also spent time with Christena Cleveland, Ruth Haley Barton, and Shane Claiborne. We played a ministry version of Shark Tank where we entered into a competition to win grant money for ministry projects. In the end, we were each given a $2,500 grant for a ministry project to grow and match at home in our areas. I was able to grow my $2500 grant to $30k for a leadership pipeline and Staff Associate in my area, through prayer and sharing vision. In a mission with leadership that doesn’t look or act like you, it's hard. It’s hard to see yourself sticking around for long, to believe you belong, and to see your longterm value in the mission. The Legacy Leader Project was a loud statement to me: “We believe in you. You belong. We value your voice." Many of us in this first cohort have recently taken jobs as Regional Directors or Associate AD's. I just was hired as Metro Director myself. Through Legacy Leader training, I am walking into this role equipped with tools and confidence! I want to be known for my leadership, my heart for Christ and kids, and my development of others. As you have conversations with your supervisor regarding your development, ask if they can submit your name to receive an invitation to be a part of Legacy Leader Project. After 77 years of ministry, the one thing that Young Life has plenty of is - MANUALS! From medical benefits, to payroll, to Wyldlife skits there is a manual that explains, informs and tells the reader what to do in a few easy steps. With an organization our size-manuals are needed to insure common language, understanding and quality of ministry. That has never been more true! That being said, in 2 Corinthians 3:2, Paul mentions that “You yourselves are our letter, written on our hearts, known and read by everyone.” While Paul is speaking in regard to the validity of his message, the concept is the same: people indwelled by the Holy Spirit are our most powerful resource. Like we have become fond of saying, “God’s method is men and women!” That is why all throughout scripture believers are describe in terms like salt, and light, a wellspring, a garden, an aroma, etc. All things that draw people in and attract others. The strongest argument for the existence and presence of God is our own transformation because the manual (letter) is written on our very selves. Recently, I helped our Region compile resources for a Volunteer Team Leader handbook (another manual). As a region we wanted to affirm our commitment to the care, support, encouragement of the VTL’s and their important role in holding so much of ministry together (much like a linchpin in a wheel). The goal was to provide a simple notebook for an Area Director to walk through with a team leader over the course of a year. While the handbook turned out nicely, it quickly became clear that it was not the best and never would be the best. The reason why was simple. The very best Team Leader Training Manual is YOU! While a handbook allows for a good progression of topics and resources, at best, it serves as an outline. The real work is the relationship between a staff person and a team leader. The way we walk alongside others is simply one of the ‘secret sauces of YL.’ Nothing can top the consistent cycle for a growing team leader than a rhythm of Watch, Do, Reflect, then Repeat. Reading a section of the handbook may only take minutes, while the life on life training cycle may take many hours. At the end of the day, it may not be efficient, but it is effective. So as you prepare to train team leaders this year, here are a few questions to consider. Have I set aside consistent time to meet with my team leader(s)? Am I facilitating modeled competencies for them to witness? Am I getting to watch their work? Are we reflecting on the competencies that are being practiced? In the same way we are incarnational ministers, let’s strive to be incarnational trainers for the linchpins in our ministries. Volunteer Team Leaders are one of the precious resources of the YL ministry and deserve our best. Of course, if you would like a copy of the handbook you are welcome to download it here. But remember, YOU are the handbook that will provide the best training! Once when my son was an infant, I changed his diaper and found an undigested black bean. He was nursing at the time so this wasn’t just weird—it was impossible. It turns out my wife had eaten at Chipotle the day before. As best we could figure, the bean had simply fallen into our son’s mouth while mother and baby fed, then traveled from point A to point B wholly undigested. His tiny body could digest milk just fine, but it couldn’t handle solid food. The author of Hebrews uses similar imagery. In 5:12, he critiques his readers’ lack of spiritual progress. He wanted them to go deeper, but they weren’t ready. 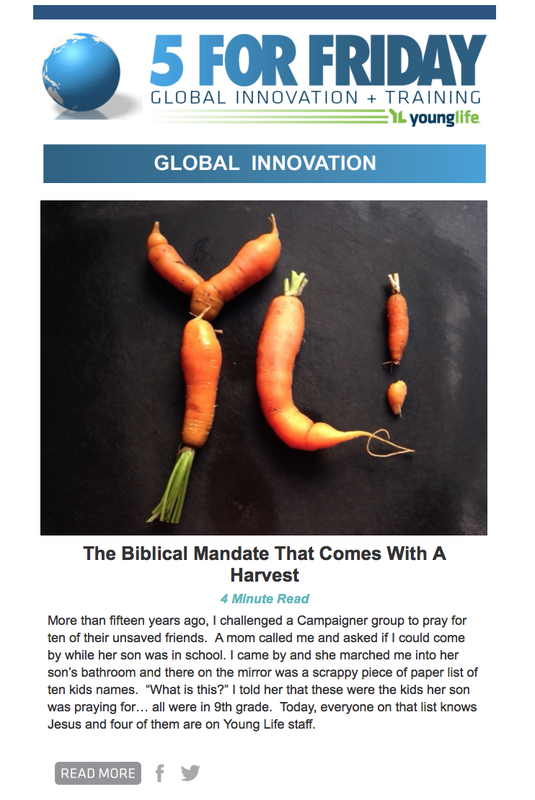 They had reverted back to spiritual infancy and become like babies who “need milk and not solid food.” This critique doesn’t necessarily apply to our Campaigner friends (who often are new believers who actually do need milk), but it does inform our approach to Campaigners and those entrusted to our care. Regardless of our ministry focus, one of our primary responsibilities is to walk alongside our friends as they discover the Scriptures for themselves, serving not only as their guide but also as their digestive aid. This means we must be spending time in Scripture ourselves, reading and digesting the solid food it contains. Without a doubt, this is THE most important step in preparing for Campaigners. But all too often we spend irreplaceable hours poking around online instead of peering directly into God’s word. We scour blogs and other resources, ultimately consuming the digested meals of others. You can survive on that, but shouldn’t we aim higher than survival? Consider an alternative. FIRST digest the text for yourself. 1. In a single sentence, summarize what the passage said THEN. What did Paul write to the Philippians? 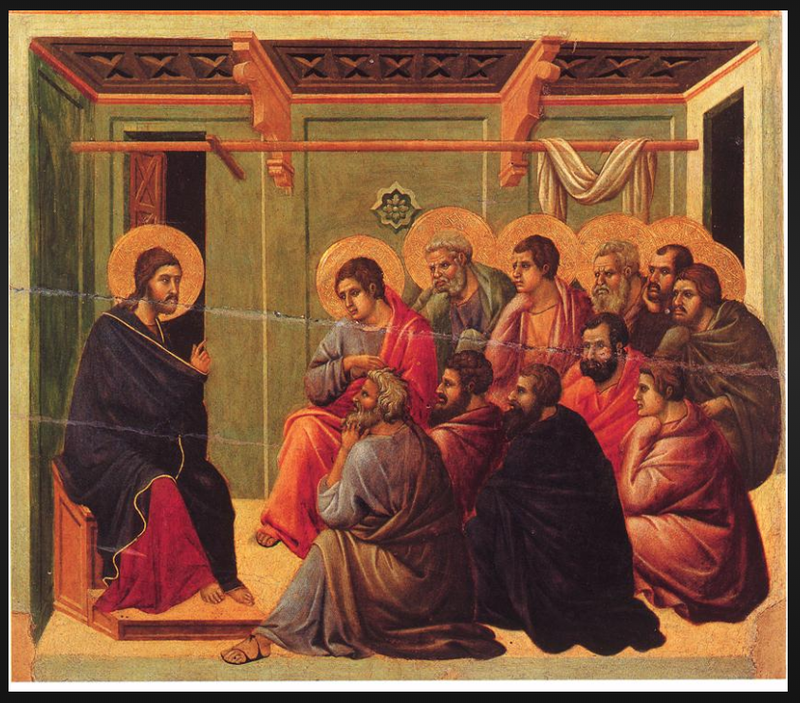 What did Jesus tell the Pharisees? Immerse yourself in the words and passage. Then filter the passage through the immediate context, the culture in which the text was written (think in terms of the first-century or ancient Israel*), the covenant that governed God’s people (Old or New), and the person of Christ (how did his life and death influence the inspired words?). This carefully filtered view will frame and guide you through the next step. 2. In a single sentence, summarize what the passage says ALWAYS. 3. In a single sentence, summarize what the passage says NOW. THEN digest the text with your Campaigner friends. Repeat the same process above, but invite the observations and experiences of everyone in the group. As you read and discuss God’s word together, use good questions that will unveil what your friends see, uncover how they feel, and unearth what they think. What you will find is that together, you’ve feasted on what’s true and eternal. That will be far more satisfying than sampling something that’s pre-made or pre-packaged. Have you ever tried to herd cats? I have literally tried this when we got three kittens a few years back and I can attest that the expression is true to its meaning 100%. Cats are fast, agile, smart, and have a mind of their own. This is often how many Young Life committees can feel too. Committees are often full of fast-moving, savvy and smart adults, who all have their unique perspectives and expertise. This is a true gift if you’ve got it, but when you have so many perspectives coming together, how do you get going in the same direction? The answer is in the Committee Chair. The Committee Chair is a vital role within any Young Life ministry. You might be surprised to find a few parts of this role that you hadn’t considered before. It might just change how your entire committee operates moving forward. Bridge - Young Life ministries need their committees, and committees need staff and volunteers who are on the front lines each day doing ministry. The Committee Chair is the core bridge, or liaison, between these two groups. He/She comes together with the Area Director to truly partner and help make sure that both groups of people are all going in the same direction. Encourager - Committee Chairs have the opportunity to encourage committee and help them to stay engaged and focused, throughout all seasons of ministry. They also are vital encouragers of the area director and staff too. Organizer - Organizing meetings, logistics, and schedules is often where we first go to when we think about the role of the Committee Chair, but the reality is that this is just a small part. Albeit an important part, it’s just a fraction of what the Chair’s role involves. Accountability Partner - The Committee Chair is the ultimate accountability partner in the area. A Chair will meet regularly with the main staff in the area and help keep them accountable to life, ministry, and spiritual goals. However, a Chair is also there to keep the committee accountable to doing what they said they were going to do. Friend: Young Life is all about relationships, which is why it is no surprise that the Committee Chair is a friend and focused on being intentional in relationship with the Area Director and committee. That friendship can have a business side to it, yes, but it also is focused on transparency, longevity, and partnership. Visionary - It can get lonely at the top, which is where many of our staff operate from. The Committee Chair is someone who has committed to invest in an intentional relationship with the Area Director. Together, they can dream and cast vision for what Young Life could look like in the local area. Since both the committee and staff/leaders can’t do it without the other group, it makes sense that the Committee Chair AND Area Director would cast vision together. Shepherd - The Committee Chair is someone that has spiritual maturity and discernment. He/She is someone who is seeking wisdom and willing to pursue that. They are there to help ensure the spiritual/financial/emotional health of the staff, committee and the local ministry. Mobilizer - Every person on a committee is vital and brings different skills to the table. Committee Chairs speak into the strengths of those on the committee and find opportunities for them to shine and thrive. Cat Herder - Committee Chairs ultimately help pull people going in different directions (leading, ministry building, fundraising, networking, praying, event planning, etc.) and attempt to get everyone moving in the same direction. As I got all these descriptions and perspectives in from leaders in Young Life from all over the world, and from all types of roles, it became pretty clear to me that the Committee Chair is one of the most vital roles within a local ministry. It’s a role that does many of the unseen things and overall direction of the ministry. It’s easy to read a big list like this and get overwhelmed by all that you could be doing. But, as soon as I got tempted to go down that road in my head, I turned it back to what a possibility this role is and the impact one role can have on Young Life ministry and the gospel. The Simplicity (and Beauty) of the Handoff! How Many Hours Does It Take To Make A Friend? Global Volunteers - Why have Club? Trip Leader: A Guide designated to oversee the smooth running of a trip. Spiritual health and focus of the team. Training and Communication to kids, parents and volunteers. Collecting and protecting and dispersing cell phones, devices, medicines, dietary needs etc. And most importantly, ensuring that YL Camp is the ‘Best Trip of their Life!” ….and lots more! Over the course of a Young Life summer we take over 3000 CAMP TRIPS both US and Internationally. They range from overnights, to week-long trips and everything in between...from our US and International properties, to Camps on Wheels, to adventure camping, to backpacking and service projects. That’s thousands of trips and on average - OVER HALF OF OUR TRIP LEADERS EACH SUMMER ARE YOUNG LIFE VOLUNTEERS! As a young staff person, I remember the trip leader role was a privileged position. It was a position of high responsibility typically reserved for the local Area Director. Decades later, I’ve noticed that the title is even more significant. On average, the local area staff person is ‘out of the area’ several weeks of a given summer (2-3 camp trips, a summer assignment and a family vacation) To address the busy schedule of a typical YL area, the ‘trip leader’ role often times is given to a senior volunteer leader. What a gift to have volunteers in the local area who give of their time and talents to serve in this way! What a responsibility it is for local staff and committee to train, support, pray for and empower this group to serve well each summer! The Trip Leader plays a vital role in the success of a camp week for their area, caring for leaders and kids and partnering with the Assigned Team to ensure excellence across the board. Several years ago several Areas/Regions/Divisions started ‘Trip Leader Training’ for all Trip Leaders (staff and volunteers) as they prepared for Summer Camping. The desire was simple: to affirm the role while giving clarity and expectation to the trip leader during the camp week. We had great success in our desire to equip and encourage Trip Leaders in their role during a summer camp week. As we prepare for the 2018 summer camping season, let's equip, affirm and encourage the key people who serve in key roles in making sure kids have the best opportunity to hear the Gospel. Click the HERE to download a sample Trip Leader Training that you can use in your local area and HERE is a link to the National website for EVERYTHING trip leaders need to know. As we continue to say around the YL Mission, ‘we are a volunteer led ministry and as we head into our 76th year, we are too good to not get better!” Let’s care for our best: Volunteer Trip Leaders. Since 2002, the Young Life Student Leadership Project (SLP) has been ushering in God’s kingdom by training students to be multi-ethnic leaders and sending them into clubs, communities, and the world. Make SLP part of your Froward Plan to transform kids who will transform your club, area, and the world! SLP is a 10-day leadership development/discipleship program for high school students completing their junior or senior year of high school. To promote a deep sense of mission, each SLP group is racially diverse, gender balanced, socieo-economically varied, and host students from different parts of the country. This summer approximately 100 students will attend SLP at sites in Grand Rapids, Michigan; Chicago, Illinois; Philadelphia, Pennsylvania; St. Paul, Minnesota; and St. Augustine, Florida. Nearly all students who have experienced SLP’s transformational program of classroom instruction, service, and personal formation become active professionals and volunteers in ministries and nonprofits in their communities! The purpose and content of SLP mirrors FORWARD’s goals. This makes it easy to include SLP in any FORWARD Plan. SLP has four “Pillars” of learning that interlock with Forward’s four strategies. Deeper – SLP students learn and apply spiritual practices. Students are taught and have quiet times in scripture and prayer each day. In addition, students experience worship and regular prayer times with others. Together – Cultural Awareness is another pillar of SLP. Students explore the impact of their own ethnicity, learn about healthy interactions with others, and experience cross-cultural life with their SLP peers. 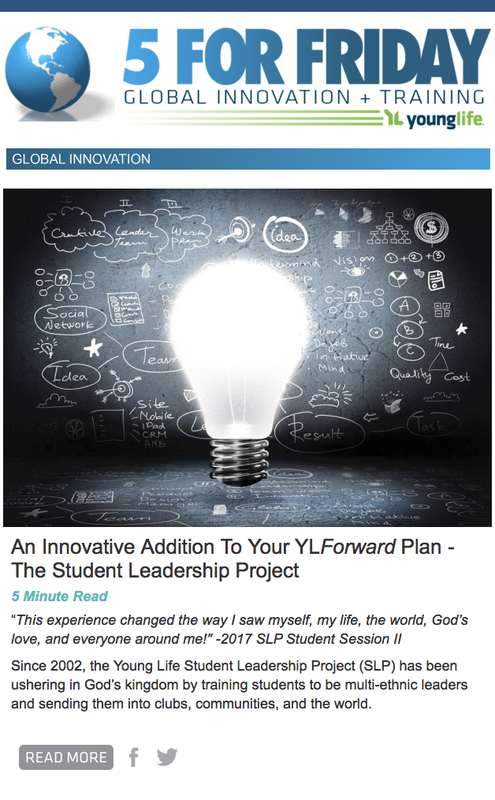 Innovation – SLP students learn to be effective, innovative leaders by understanding their Calling. Primarily called to love God and serve others, SLP students explore how to do successful ministry based on their unique passions, talents, life experiences, and the opportunities God places in their lives. Growth – Using the example of Jesus, SLP students learn Servant Leadership principles. Students are challenged to identify a personal mission for the 12 months following SLP. This year this will include organizing a project in their area in conjunction with YL Expeditions “YL Serves” on MLKJ Day, 2019. Areas can send a student to SLP to help advance FORWARD in their community. Big Areas and Metro Areas can send several students for a shared SLP experience to help initiate multi-ethnic ministry between schools and within a community. Regions can send a cohort of students to SLP to create a network of young leaders in the region and promote student led projects. Divisions can support an SLP site for their Division, identify and send students who show staff potential as a gateway to staff development. Guess This Best Kept Secret of YL Training? We're going to clue you in on one of the lesser known secrets around Young Life. Training Timeline courses are designed for Senior Staff and emphasize specific training for both the ‘Age and Stage’ of the staff-person. Simply, “The training you need at exactly the right time!” Staying sharp in your role with a changing culture is a challenge. That is why we are always learning and growing in both our faith and ministry skills. That’s why Training Timeline programs are so vital. Below, you will see that next year’s classes are tied strategically to the YL Forward pillars of Innovation, Together, Deeper and Grow. If you’ve completed your initial (Core 1) staff training, these classes should be on your radar! Our current list of Instructors are a who’s who of theologians, experts and senior staff around the YL mission like David Livermore, Brad Systma, Pam Moore, Crystal Kirgiss, Newt Crenshaw, Donna Hatasaki, Terry McGonigal, Ken Knipp, Brian Summerall, Sha Farley and several others. Discipleship: Growing Deeper – Taught by a team of veteran YL staff specializing in Discipleship principles and methods. Supervision and Organizational Leadership – taught by a team of Senior mission leaders including Newt Crenshaw. Legacy Leader – this is a diverse group of leaders who meet for advanced leadership training over a two-year period. And...we are still adding more!! Stay tuned! Your next step: JUST DO ONE THING! Step 1: NOW set up a conversation with your supervisor or the staff person you supervise about which of these would be the best fit for this coming year. Your yearly Leadership Development Review is the perfect timing. Registration will be open the first week of August for the Academic and Practical Training Timeline classes. Here’s to being a lifelong learner and to taking your own leadership development to the next level! Ask ten people to define discipleship and you will get ten different responses. Ask fifteen people to describe what’s involved in discipleship and you will get fifteen different lists. Ask twenty people to identify the main goal of discipleship and you will get twenty different ideas. Overwhelmingly, Christians believe that discipleship goes hand in hand with following Jesus. And yet, according to a 2015 Barna study (The State of Discipleship), Christian adults, educators, and leaders struggle to clearly articulate the what, why, and how of discipleship. Perhaps we are over-complicating a straightforward reality. Or maybe we are over-simplifying a profound mystery. Whatever is behind the current discipleship conundrum, the global Young Life mission remains just as committed to the second half of its mission statement — helping adolescents grow in their faith — as to the first half — introducing adolescents to Jesus Christ. So let’s start with discipleship. Discipleship is becoming more like Jesus. That means disciple-making or discipling could be defined as simply as this: Helping others become more like Jesus. Defining disciple-making in this way clearly states the goal of our mission and also empowers staff and leaders to tailor things for their unique ministry context, community culture, personal giftings, and the Holy Spirit’s guidance. We are a disciple-making ministry. It’s right there in our mission statement. More importantly, it’s in our DNA. We introduce adolescents to Jesus Christ (by our presence and our proclamation), and we help them grow in their faith (by grounding them in The Faith). That’s who we are. It’s who we’ve always been. Leadership conversation starters on discipleship and disciple-making. How would you define discipleship, based on your personal journey and experience of following Jesus? Is that different from disciple-making / discipling? In what ways? How does Young Life’s mission statement — both parts of it — drive your local ministry? Based on the definition provided above, what does your local ministry include in the by list for disciple-making? What is your ministry doing well when it comes to disciple-making? What areas need growth? How do your leaders - both individually and corporately - focus on their own discipleship? Crystal Kirgiss (PhD, Purdue University) is the VP of Global Discipleship. She’s married to Mark, a Young Life Senior Area Director. For over 30 years, she has been involved in youth ministry as a Young Life and WyldLife Leader, a youth ministry trainer, and an author and speaker. She can be reached at crystal.kirgiss@comcast.net. You can find a summary of the Barna Discipleship Study HERE. You might want to check out The Skinny on Discipleship: A Big Youth Ministry Topic in a Single Little Book (Group Publishing, 2015) by Katie Edwards, a veteran youth worker. Her book was the inspiration for the simplified and streamlined definition of disciple-making offered above. Your Banquet Season Is 12 Months Long! With that positive experience in mind, there are three numbers that will help you accomplish that feeling as you look forward to your next banquet: 2, 12, and 15. Every banquet has two aspects. The PEOPLE and the PROGRAM. Most Staff and Committees are familiar with program. You know how to set up the room, tell that one story to communicate the heart, passion, and commitment of Young Life. The issue, more often, is getting people into the room. The process of getting people in the room for the banquet is not much different than getting people in the room for club. It’s all about contact work. A club full of kids is a celebration of excellent contact work. A banquet full of adults is a celebration and natural extension of great contact work with adults. Just like a club flyer should not be a kid’s only invitation to club, the physical banquet invitation should not be the first time your guest has been invited to the banquet. What if you pursued adults in your community like you do kids in the local school? What if you “sold” the banquet and planned for it months ahead of time? What if you were committed to helping people get there because it’s a chance to experience what God is doing and to be a part? After a week at camp, you probably begin thinking about next year the next day (if not on the bus ride home). I’d be willing to bet camp crosses your mind almost every day of the year. Banquets need to be the same. While camp can be the best week of a kids life, the banquet can be the best night of the year for your community. We should look forward to that night with great anticipation all year long. The best banquets are done on with a 12-month strategy, just like camp. A 12-month cycle means follow-up after the banquet is essential, like reviewing those commitment cards and actually sending people information about the golf marathon. Maybe there’s a banquet reminder in your Christmas letter, or you’ll casually mention the banquet next time you meet a donor. Take 15 minutes today. You’ve read this article. Now watch the video below to get a better picture of this process. Next, write down “people” and three things you can do over the next three weeks to invite people to be part of what God is doing, which is always an invitation to fuller life. No matter how far away your next banquet is, the process starts today. Be excited. And if you want to smile when you think about banquets, schedule time (not today) to think through the two aspects, People and Program, and what you can do each month to make your next banquet a no-sweat success. Summer camp is not the end of your ministry year! It’s actually the starter’s pistol for your fall club start. There is no other place or time in the world where your kids will be more enthusiastic about Young Life and sharing Christ with their friends than during the last days of summer camp. If we don’t take advantage of that fact, momentum and opportunity will be lost and be nearly impossible to get back or recreate six to eight weeks later when school starts again. Day 7 of the camp experience is one of the most important days. There are plenty of staff folks who believe the area meeting at the end of the camp week to be a pivotal time of vision casting and celebration for kids (and leaders) on a summer camp trip. You might even be a trip leader who would value some direction on how that time can best be utilized. You’ve just eaten 21 meals in a row together. Without proper planning, 24 hours from now, many of those kids will be sitting on the couch at home alone eating something out of a fast food wrapper, wondering if what happened this past week was real. Who does the lion attack? The sheep in the middle of the pack or the one who is off on their own? Who does Satan attack? The kid who is in the middle of the pack or the one who finds himself suddenly alone? The adventure has just begun! Don’t dare wave at the bus and say we’ll get together in a week. That’s too LATE! You can download the story HERE, about how two sixteen-year-old work crew kids prayed for Frontier Ranch. The idea is to let kids know they can change their school and that God wants to use them! I always ask my high school friends after telling this story in our day seven meeting at camp, "What are you praying for your friends... safe things, easy things, anything? Or are you praying "big things"" because we have a big God? Two sixteen-year-old kids prayed big things 60 years ago, and many of your lives have been changed. Two sixteen-year-old kids prayed big things and thousands have come to know the Lord at Frontier. You can do the same!!! 3. Vision casting for the upcoming school year with Young Life and how to get their friends (and new freshmen) in on it. Talk about (with great enthusiasm) what the upcoming school year could look like if “we all” stacked hands on making Young Life great at their schools. What if we dreamed big and prayed big? They could be the difference makers! Give them a vision for a reputation and legacy to grow into! And give them a vision for doing something REALLY different...embracing freshmen and bringing them along for the ride! 4. Have a few kids talk about how this camp week impacted them. It might be a great thing during your area meeting to hear from two or three kids about how this camp week impacted them in ways they didn’t see coming. Give them 30-60 seconds to give a “quick word” about their week. Or it might be an excellent time for a second timer to share about the importance of sticking together after camp and also being a part of the camp follow up things. 5. Have each kid write to a donor back home on a postcard. Nothing fires a donor up more than hearing first-hand from a kid! The area meeting is a great time to have each kid on your trip write a postcard or two. Put a template on a screen or flip chart to show the “bones” of what to write. But don’t make your template force words they’re not prepared to write. Give them options of sentences to write. Take your area picture on Day 2 after the volleyball tournament or rodeo and then use an online company (clubflyers.com or gotprint.net) or the Service Center and have them quick shipped back to you at camp before the area meeting. It may cost a little bit, but it’s worth it! 6. Handing out area t-shirts so everybody can wear them on the last day. Everybody longs to be a part of a bigger story, to belong. There’s just something about everyone on your trip running around with the same shirt that reminds kids and leaders that we did not experience this week alone. Not only that, we don’t go home alone. We came to camp as individuals, but we leave as a family. Trip t-shirts help create that feeling and serve as a reminder back home of the decisions and relationships that were made at camp. REMEMBER: The Area Meeting on Day 7 is yours to run with. These are merely some ideas to help get your wheels spinning... not meant to overwhelm you with “have- to’s." The time is yours. Use it well! For more info/help write to: bsummerall@mac.com or ylhubcity@msn.com. Click HERE to download camp follow-up resources. Click HERE to download an “End of the Week Area Meeting” guide along with the Jerry Kirk and Cy Burris story.